Candidates should be able set up and customize a display manager. This objective covers the display managers XDM (X Display Manger), GDM (Gnome Display Manager) and KDM (KDE Display Manager). Turn the display manager on or off. Change the display manager greeting. Change default color depth for the display manager. Configure display managers for use by X-stations. Different versions of display managers as well as different Linux distributions may use slightly different steps. In general however, note that startx uses xinit whereas xdm uses Xsession. This display manager is installed with the KDE desktop environment. It is based on the generic xdm display manager and shares many common configuration files. These configuration files for are in /usr/share/config/kdm. The file that controls most functionalities is kdmrc. We will look at the xdm configuration files in more detail later in this section. Display managers allow local users to log onto the system using the graphical interface. They can also be used to provide a graphical login interface over the network. For this they use a protocol called XDMCP or X Display Manager Control Protocol. By default XDMCP is disabled (we will enable XDMCP as an exercise). Since the Display Manager is also an x-application, the fonts, the background colors and xlogin can be configured with the Xresourses file in /etc/X11/xdm/. When using gdm, the /etc/X11/gdm/Init/Default script will source Xresources. This file simply maps the name of a display with an X server. For example display: 0 is understood to be the local X server. Remember that X always runs on the first free /dev/tty. 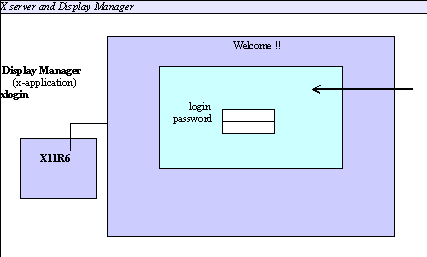 Since the Display Manager is also an x-application the Xresources file is similar to the .Xresources file except that it controls how the login screen is displayed.
! use authorization only for local displays :0, :1, etc. This page was last edited on 9 October 2012, at 21:37.